Markelle Fultz is taken by the Philadelphia 76ers and becomes first Washington Husky taken No. 1 overall in the NBA draft. 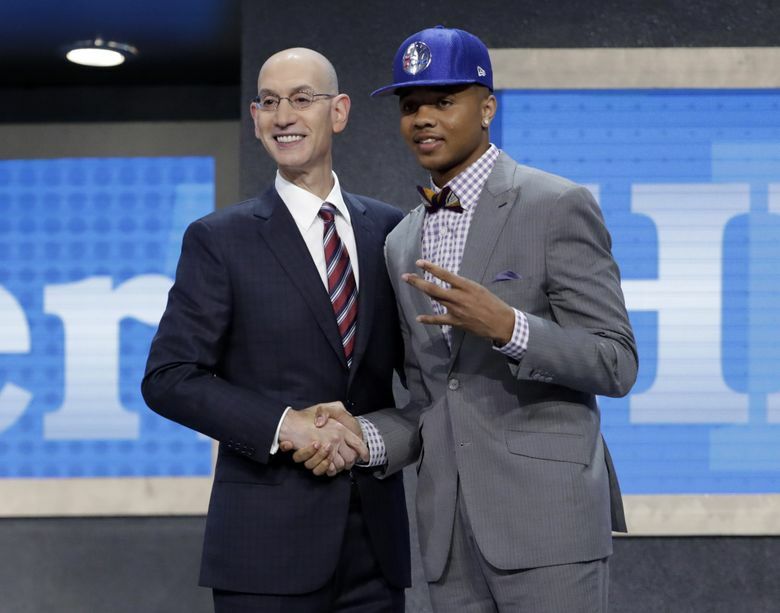 The Philadelphia 76ers selected Markelle Fultz with the first pick in Thursday’s NBA draft, which made him the first Washington Husky to be selected No. 1 overall. Last season the 6-foot-4 point guard led the Pac-12 with 23.2 points per game while averaging 5.9 assists and 5.7 rebounds in 25 games for a UW team that finished 9-22. Fultz, who wore a gray suit, a purple checkered shirt, brown bow tie and orange shoes made from basketball leather, didn’t have to wait long inside the Barclays Center in Brooklyn, N.Y. to hear NBA Commissioner Adam Silver call his name. Before walking to the podium, Fultz kissed his mom Ebony Fultz, hugged longtime trainer Keith Williams, his sister Shauntese and former UW coach Lorenzo Romar. After Fultz, the Los Angeles Lakers selected UCLA freshman Lonzo Ball at No. 2. The next three picks included Duke freshman Jayson Tatum (Boston), Kansas freshman Josh Jackson (Phoenix) and Kentucky freshman De’Aaron Fox (Sacramento). According to the NBA rookie salary scale, Fultz is slotted to earn $5.8 million in 2017-18 and is guaranteed $20.8 million in his first three seasons. He could earn as much as $30 million in his rookie deal with the 76ers. Fultz became the 14th UW Huskies standout taken in the first round of the NBA draft. The others include: Marquese Chriss (8th, 2016), Dejounte Murray (29th, 2016), C.J Wilcox (28th, 2014), Ross (8th, 2012), Wroten (25th, 2012), Quincy Pondexter (26th, 2010), Spencer Hawes (10th, 2007), Brandon Roy (6th, 2006), Nate Robinson (21st, 2005), Chris Welp (16th, 1987), Detlef Schrempf (8th, 1985), Bob Houbregs (3rd, 1953) and Jack Nichols (12th, 1948). Fultz is the second Washington Husky basketball star to go No. 1 in the draft this year joining Kelsey Plum, who was taken first overall in the WNBA draft.